The Ford NAA had a 134 cubic inch, inline four-cylinder engine that ran on gasoline and gave farmers 32 horsepower. The four-speed transmission would get farmers going at nearly twelve miles per hour. The NAA had Solid System hydraulics that relied on an engine-driven pump, making a live PTO optional. This was different from the N-Series in that they came standard with a PTO-driven hydraulics pump. The Golden Jubilee was also a bit larger than the N-Series of tractors. The tractor had a wheelbase that measured at 73.875 inches, the length at 119 inches, a width of 64.75 inches, and height of 74 inches. It also weighed 2,814 pounds, which was about a hundred pounds heavier. I have a 1954 NAA. I am in need of a carburetor for it. It has a Marvel Schebler TSX 428. I sent it to a local shop to have it rebuilt and the venture was lost during the rebuild. Haven’t been able to locate that part. Can anyone help? It has been suggested that I buy a zenith brand. I am not sure what I should do. Do anyone have any suggestions? I am not building a show tractor. I use this tractor for odd jobs. I want it to start and run for everyday use. 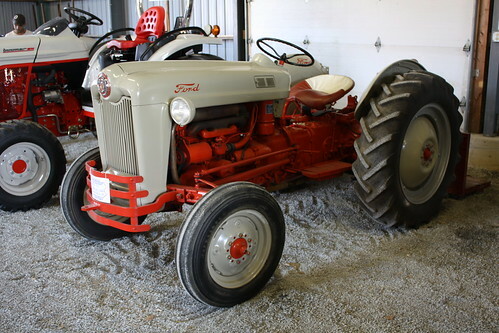 I have a 1953 Jubilee that was equiped with live pto option. When used in hot weather, such as hay season, it would slip when fluid got hot. I took it out thinking I would have the clutch pack rebuilt. After 3 back surgeries, 2 strokes, and heart surgery I sold hay equipment and still have parts that I would like to sell. Don’t know what to ask but I know a lot of people have asked me to price the parts. Anyone know what they are worth or anyone interested? Hi, If you still have the Ford NAA live PTO parts I would be very interested in buying them. Thank you and I sure hope this works out. Gordie B.